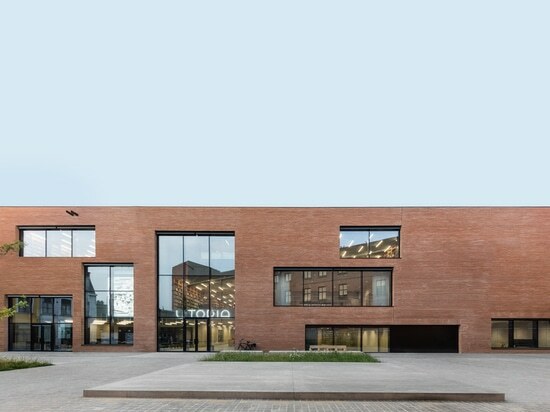 Utopia, the Library and Academy for Performing Arts, housed within a brand new building designed by KAAN Architecten, has opened its doors to the Flemish city of Aalst, following an open competition launched in 2015 by the City Council. 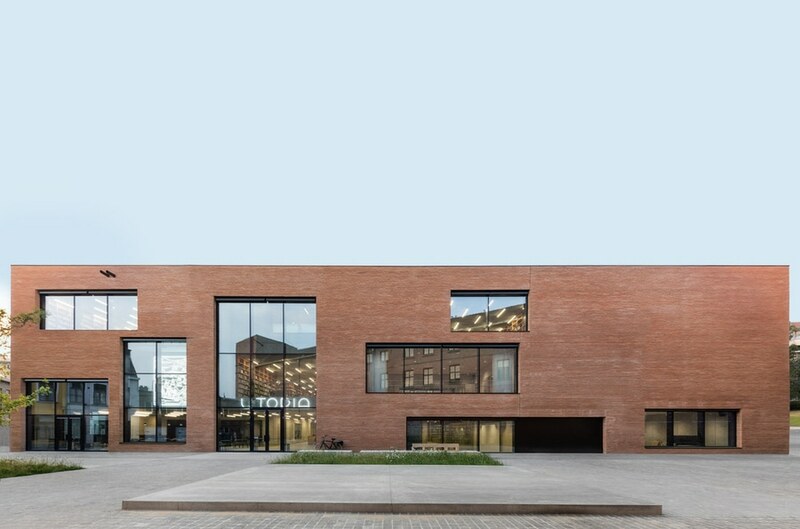 The 8.000 square-meter brick structure incorporates a striking historic building from the second half of the Nineteenth century and rejuvenates the urban landscape while elegantly giving expression to the required functionality. The city chose to establish a Public-Private Partnership (PPP) based on a Design &Buildcontract. The projectwasassigned to the team consisting of Van Roeyasmaincontractor and KAAN Architecten asarchitectthatworked in closecollaboration. 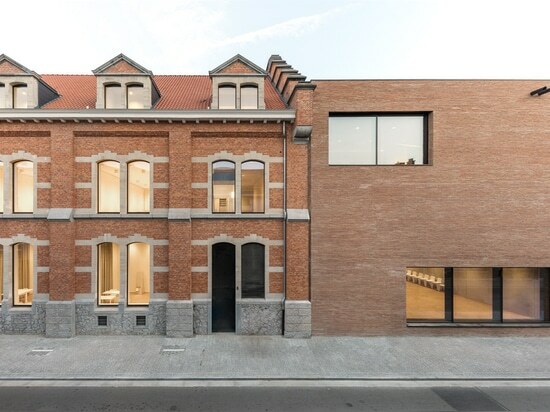 Taking its cue from Thomas More’s acclaimed book “Utopia”, first printed by prominent Aalst citizen Dirk Martens, the new building has been slotted into the urban fabric to enhance the characteristic irregular streets and intimate spaces of the city center, and to interact with them. Three new squares have been created alongside Esplanadestraat, Graanmarkt and Peperstraat. The so-called Pupillenschool, a building from 1880 was formerly a school where children of soldiers were educated until the age of 16 when they could register for a regiment. It has been embedded into KAAN Architecten’s design and is now the cornerstone of the new building. 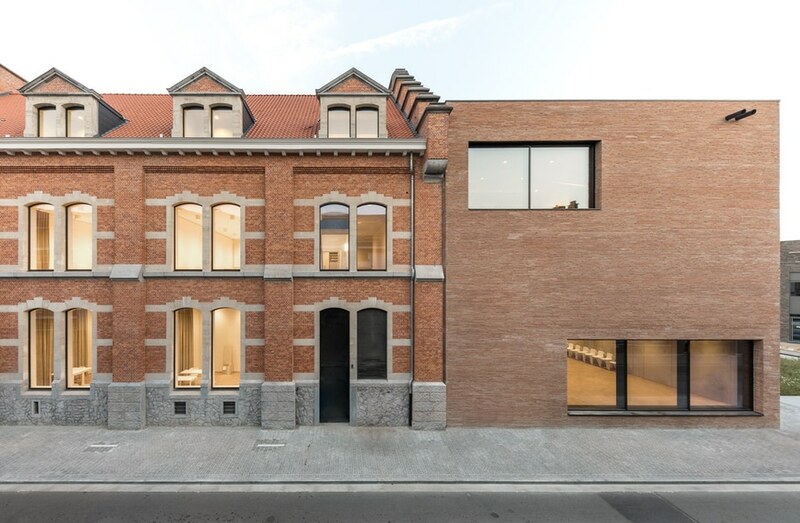 Both outside and inside, the historic façades blend perfectly with the generous spaces, while the brickwork dialogues with light gray concrete elements. Utopia, the city, and its residents are inextricably linked, and can gaze at each other through tall and wide openings, carefully sliced out of the brickwork. The entrance to the building is located on an intimate square between the reading café and the auditorium. Moving through the wide hall, the open interior landscape of the building unfolds from floor to ceiling, and cantilevered into the space are several thick concrete floors that appear to float. 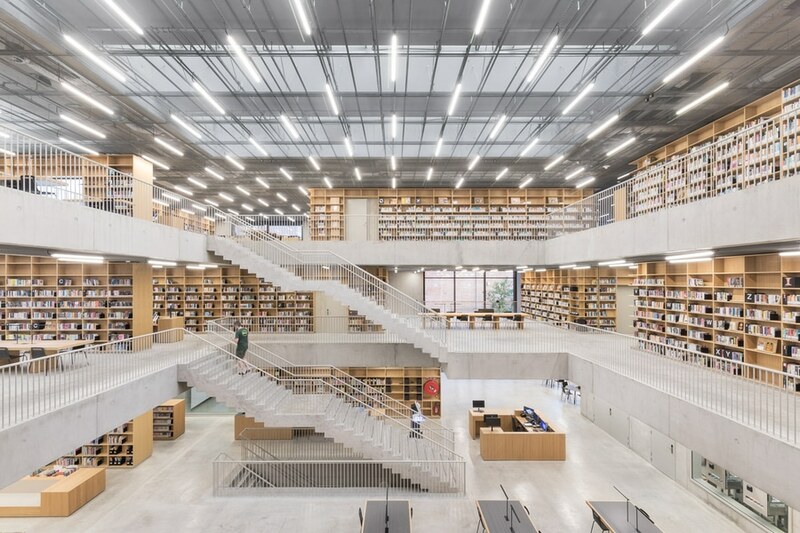 Hanging at varying heights, each level features bookshelves and reading tables, while looking into the atrium and towards the brick façade of the pre-existing building. Moreover, a 11.50 meter high bookcase stretches towards the ceiling, filled with books donated by each Aalst resident. The concrete structures seem to be supported by books. The bookcases are pushed up against concrete discs which allow the floors to cantilever out without extra support. Mimicking the treads, the stairs zig-zag upwards, giving the staircase a sculptural presence at the periphery of the magnificent atrium and reading room. The ceilings have been minimalized to the point of being almost undetectable. All the technical systems are concealed behind a stretched metal-coloured mesh that softens the strong daylight and creates a pleasant atmosphere during the day. Apart from the ground floor auditorium, the Academy for Performing Arts is housed on the first two floors, flanking the reading atrium. Within the new building, the ballet room, rehearsal studios and teaching spaces have windows as tall and wide as the rooms themselves, providing a view onto the city and a glimpse inwards from the city, while giving expression to the façade composition. Using the same expressive language, the railings of the former Pupillenschool’s windows have been removed and the windowsills of the piano nobile have been significantly lowered. 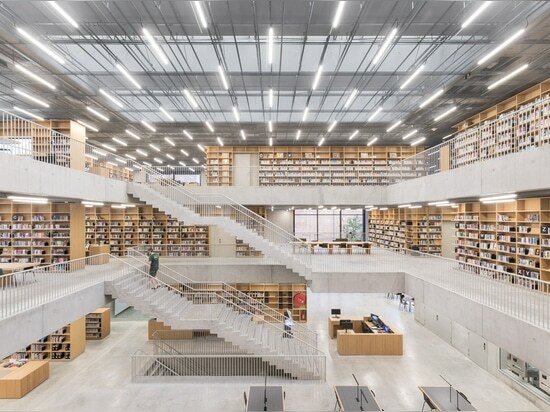 Acoustics was a fundamental design tool for KAAN Architecten: the reading in the Library should not be disrupted by music lessons and play’s rehearsals. Suspended concrete floors replace the original wooden floors, doors are transformed into sound barriers, and double glazed windows capture each single piano note. Much of the building’s exterior consists of new brickwork. The predominant colours of the Flemish city were studied and the architects chose a dark brick called “Red Aalst”. To accentuate Utopia’s duality, these long flat bricks (50 x 10 x 4 centimeters) have been laid in horizontal format to complement the vertically-oriented old school façades. Utopia’s openness also exudes sustainability. The building has achieved an BREEAM Excellent rating: materials and labour were locally sourced, low-energy machines were used for construction, solar panels, geothermal heat and LED lighting have been integrated in the design, rainwater is recuperated and buffered, and 230.000 bricks were chipped away and reused elsewhere. The desire of KAAN Architecten to interact with the urban fabric has been achieved: Utopia is already a reference point in Aalst city center, with citizens eager to enjoy and welcome a new landmark in their everyday lives.